The text below was written in conjunction with the façade and marquee installation at Regina Rex. The text was typeset as it appears here and was printed as an offset-lithograph, available at the gallery. In July of 1948 The Aluminum Development Association, London, UK, published The First Factory-Made Aluminum Bungalow. The publication was a small and remarkably banal booklet, which detailed the transformation of aluminum from a complex wartime industrial material into a simplified form of prefabricated domesticity. The booklet functioned as both a proposal and a justification for the implementation of a program of inexpensive, mass-produced, and easily assembled aluminum homes configured from the remnants of the wartime aluminum industry. Among the publication’s more notable points is the description of the program as an overarching success. The use of the word “story” is the first clue that this is a designed fiction that narrates a trial approach to industrial implementation. The program appears strikingly real and of long-term value in the booklet, as though it is a foregone conclusion. Further still is the complication that this “story” is told as though for the common good, chiefly to hide its more duplicitous pragmatism: this is an approach to control a potentially unstable workforce, to save capital in the form of labor, materials, machines and trade, and to quickly and cheaply solve a growing housing deficit, another measure meant to control a potentially disgruntled domestic citizenry. The report is rife with strange language, which are precisely the kind of subtle intricacies and contradictions that serve as the subject matter for Graham McDougal’s richly layered, yet visually concise, paintings, prints, and in this instance at Regina Rex, installations that blend sculpture, print, lightbox and painting. From war machine to domestic dream, aluminum was transfigured through a shift in context and intent. What happens when a material, or an idea, undergoes this kind of shift in conceptual orientation? Perhaps nothing, maybe everything. This kind of all-too-subtle material change exists at center of Graham McDougal’s work. More aptly though McDougal uses this same kind of shift in his own work to capture, and simultaneously pose questions through the juxtaposition of photography, sculpture, print and painting, about the oft overlooked nature and implementation of specific materials: is industrial production distillable as a language or a series of tropes? Is there a discernible semiotics of urban vernacular signs that isn’t based in text, but in shape, density, tone, use value or concept? Answering these elliptical questions isn’t quite the aim; McDougal is more interested in enacting the possibilities, and engaging in Harman’s exercise by creating conceptual loops. McDougal creates cyclical structural narratives, which work on multiple levels simultaneously to extend a formal logic that blurs the line between the illustration of an object and the actual object itself. These conceptual loops are essentially aimed at engaging the meaning of production, or the problems of producing multiple depictions of the same material in different forms and contexts, and describing how subtle changes can alter meaning and context. Just as Marcel Broodthaers, Martin Boyce, Jenny Holzer, and Ken Lum among other artists extend the very systems of language or knowledge in which their works take shape—granite, bronze, furniture, installation, and vernacular signs—McDougal depicts the characteristics of a material—industrial aluminum—through a series of interrelated angles. The black and white vinyl on the light box façade and the vacuum formed sign installed outside of Regina Rex are extensions of two of his recent paintings, which were both derived from a series of instructional diagrams that are part of the Aluminum Development Association report. The two paintings, Aluminum Sections (2014) (Figure 2) and Interior (2014) (Figure 1) become two unique depictions of the aluminum sections from the report. Interior, is a pink-tinted, digital rendering of the aluminum end sections made into furniture using the extrusion tool in Photoshop. These extruded furniture objects are depicted and situated within a post-industrial white cube gallery space. Aluminum Sections, takes the front facing short ends of the aluminum sections and turns them into a series of distinctive forms, a concrete alphabet of lightly sketched white lines extending from a flat blue background—aluminum poetry. More specifically though, Lum and McDougal both draw attention to overlooked changes in usage and material implementation that, if acknowledged, or even evolved further, allow us to evaluate the subtleties of the materials that surround us. These materials make up our lived experience in a hyper constructed visual and physical landscape and are all too often taken for granted as silently pre-rendered forms, unavailable for evaluation or alteration—presented in the same manner as the aluminum bungalow, as foregone practical conclusions. Which of Lum’s subtle alterations draw the viewer’s attention, and why? Is the change from sign to image important here, or is it the mimetic and accessible quality of the sign’s colors, lettering, and friendly, but flat offering of clean and comfortable rooms that draw one in? Here, this small double sided one-sheet, becomes a third site of production through which McDougal continues to extend his central lines of inquiry about production and the nature of objects. The first site is the two paintings Aluminum Sections and Interior and the second is the signage and lightbox on the exterior of Regina Rex. This third site achieves many of the same aims that Lum sets out with, and like the planned aluminum bungalow, it is haunted by the vocabulary, the shadows, and the redundancies of its precedent material, the wartime aluminum, which is now a domestic promise grown from the mechanisms of potential destruction. 3 Sutela, Jenna. Add Metaphysics. Aalto University, 2013. Pg. 50-51: 1. The independent reality of a thing is appreciated if we imagine it inhabiting other situations or having other effects than it currently does. These are known as “counterfactuals.” 2. The independent reality of a thing is also appreciated if we imagine that it were composed of different elements. Coining a new term we can call these “countercompositionals.” The assignment is to explore both counterfactuals and countercompositionals for any given object in order to better appreciate the autonomous reality of those objects. Step 1: Each student is given a slip of paper, and writes the name of an object—a person, an animal, a thing, a fictional character, a corporation—indeed, anything at all. The slips of paper are then put into a container. Step 2: each student draws one of the slips of paper and must work with the object inscribed. Step 3: The student should determine the counterfactuals for this object. Start by asking: In what situation do we usually find tis object? Then, the student should imagine other possible situations for the object, starting simply and working toward more and more imaginative scenarios. What surprises result from this exercise? Is this object capable of things that we never realized? How would the world need to change in order for this object to acquire greater or lesser impact than it currently has? Step 4: The student should now determine the countercompositionals for the object. How could we rebuild this object using different materials or components? What is the greatest number is of changes we could make while still having the object remain roughly the same thing? What is the smallest change we could make that would destroy the object or turn it into something else altogether? Step 5: Students should now discuss all of their results together. Are any of the results especially funny? Especially surprising? Especially frightening? Figure 1. Ken Lum, Jim & Susan’s Motel, 2000, Plexiglas, plastic letters and enamel with powder-coated lacquered aluminum frame 65.1 x 182.8 cm. (65 x 72 in.) Image Courtesy of the Artist. Figure 2. 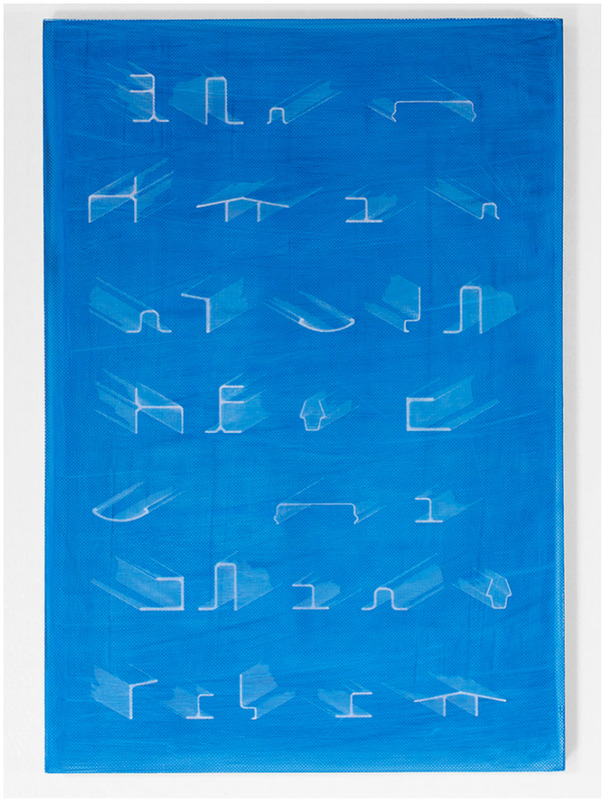 Graham McDougal, Aluminium Sections, 2014, silkscreen ink and acrylic on panel, 42.5 x 27.94 cm (16.75 x 11 in.) Image Courtesy of the Artist. Figure 3. Graham McDougal, Aluminium Sections, 2014, silkscreen ink and acrylic on panel, 27.94 x 42.5 cm (11 x 16.75 in.) Image Courtesy of the Artist.